As has long been the case, Apple's terms and conditions for repairs stipulates that the company will not service products that have failed due to "unauthorized modification," including "faulty installation, repair, or maintenance by anyone other than Apple or an Apple Authorized Service Provider." Apple's limited one-year warranty is also void if a product has "damage caused by service, including upgrades and expansions, performed by anyone who is not a representative of Apple or an Apple Authorized Service Provider." 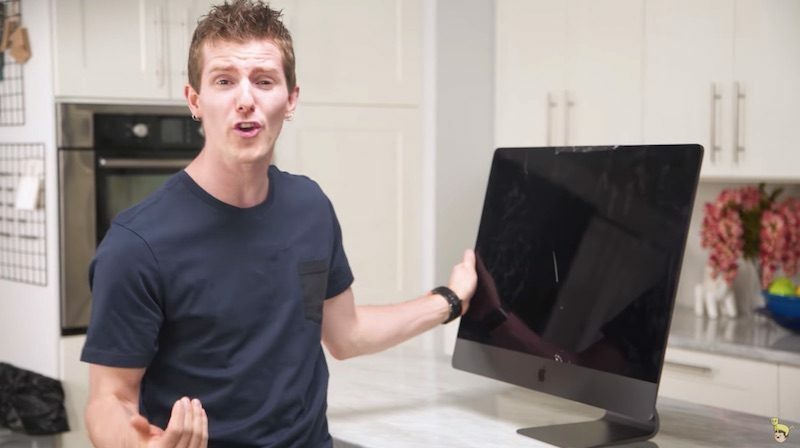 In his defense, Sebastian confirms he is aware of those policies, but his argument is that Apple should still be obligated to repair the iMac Pro if he pays out-of-warranty fees. In the video's comments section, reaction is mixed, with some people agreeing with him and others siding with Apple. iMac Pro is a non-user-upgradeable, all-in-one workstation by design, so it's easy to see why Apple may not be interested in servicing one that was fully disassembled. While the team at Linus Tech Tips may be more tech savvy than some, a lot can go wrong when an average customer tampers with internals. However, Apple's internal iMac Pro Service Readiness Guide obtained by MacRumors states that ATLAS online training and learning resources for servicing the iMac Pro have been available in English since December. We also spoke to multiple sources who completed the course and received certification months ago. In the end, Apple has to draw a line somewhere, and not everyone will agree with it. MacRumors contacted Apple, but a spokesperson declined to comment. We've also contacted Linus Tech Tips for comment. The main point is that Apple refused to ship the replacement parts to an authorized third-party reseller because working on the iMac Pro requires a special certification that doesn't even exist yet, and it sounds like no repair instructions have been written either. Assuming this is actually true, that's quite unimpressive of Apple to release a product that they themselves don't even know how to fix. I suppose an overreaction here was inevitable. He said he knew he'd have to pay for the repair, and was fully willing to pay for it, completely uncovered by warranty, but they outright refused to repair it, regardless. Makes no sense to me. His YouTube videos are pretty entertaining, imo. I don't get the hate. What is it with everyone failing to understand that he is not expecting to get this repaired under warranty and fully upfront with his asking to pay for the repair himself? Great policy that forces one to buy a new computer. I don't buy the excuses in the article. Sell replacement parts and let a 3rd party fix it if Apple is not interested. Anyone that thinks my way should visit http://repair.org.